Win this brand new 1968 Mercury Cougar! 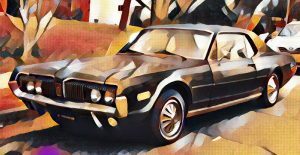 West Fargo, ND – To celebrate the fact that the FM Observer has once again won the best website award in North Dakota, we are having a drawing for a brand new 1968 Mercury Cougar. This gem of a car is a two-door hardtop which comes with a powerful 335 horse power V-8 engine, features hidden headlights, and comes with only 500 miles on it. Not only was this the Motor Trend car of the year, but it could be yours just by entering your name for the drawing at our FM Observer Corporate Headquarters. Other prizes include: a one-way trip to Grand Forks, a lifetime supply of shrimp, a personalized hot air balloon, rental property by NDSU, a double-decker house boat, and your very own office at the Red River Valley Zoo! You can only enter your name once, but you can enter as many times as you’d like by using pseudonyms. Good Luck to all and thanks for reading the FM Observer!